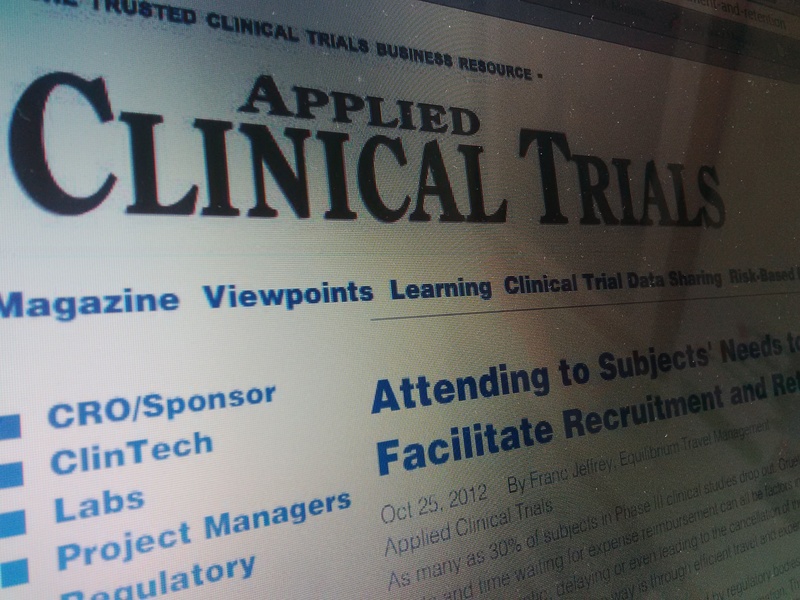 As many as 30% of subjects in Phase III clinical studies drop out. Gruelling schedules, high travel costs and time waiting for expense reimbursement can all be factors in these fall rates, and this can be problematic, delaying or even leading to the cancellation of the trial. It is crucial to keep subjects motivated, and one way is through efficient travel and expense management. Confidentiality rules and regulations stipulated by regulatory bodies such as the FDA and EMA ensure that a sponsor cannot know specific patient information. This made the arrangements of travel and expense reimbursement for the subjects challenging. The concept was formed 10 years ago on the idea of being the middleman between the investigating site and sponsor. Subjects are given the choice to use and contact the independent, third-party travel service directly. As the service is used by choice and in conjunction with pre-approved travel and expense guidelines, Institutional Review Boards (IRBs), Independent Ethics committees (IECs) or Ethical Review Boards (ERBs) are satisfied that subjects are not being enticed to use the service. To make sure that no sensitive information is relayed to the sponsor, codes are assigned for subjects and the study in place of personal information. Travel is then organized on their behalf. The bills go directly to the company, which can then de-identify any sensitive information and charge back to the sponsor. To ensure that personal information is not leaked, Equilibrium uses its own vendor accounts for all billing, reimbursements and reservation processes. Through a three-stage manual check process, information is de-identified and then reported back to the sponsor who would see patient IDs, dates of travel, dates of booking, types of travel and cost – but no specifics about the person. In addition to keeping an eye on costs, this process allows to ensure patient IDs match dates of clinic visits. Proactivity is key in organizing travel arrangements for subjects and this can be enabled through the possession of a study schedule so that dates of all visits are known. Through forward planning, arrangements could be made to ensure no study visits would be missed due to flights or hotels selling out during peak travel periods. Expense reimbursement has been added to subject payment services to address any out of pocket expenses or stipends. Conducting multi-site studies can often be a daunting task from both logistical and budgetary viewpoints. This is particularly true in emerging markets where there are often cultural differences and language barriers to overcome. By utilizing the services of a network or global partner, it ensures that the provider can draw on valuable local knowledge that is familiar with travel requirements and customs unique to their region. For example, on one trial, subjects from Paraguay were happy to travel by ferry from Monte Video to Buenos Aires for infusions and back in one day. In the same study, in the United States, subjects arrived in town for their infusion the evening before so that they could arrive at the site first thing and be there all day before departing for home. The same trial in Russia allowed subjects to temporarily relocate via company-rented apartments to the city of their trial site due to lack of public transport infrastructure. Additionally, local currency expense reimbursements and all travel arrangements using global partners are billed centrally. This offers sponsors consolidated financial data from one reporting system and immediate visibility of study expenditure. CRO’s have also used this service to offset the administration of subject reimbursement and address potential tax issues. In many countries, there are tax implications with sponsors sending money to CRO’s to reimburse subjects as cash payment. With the Equilibrium model, the subjects are the first and only recipients of the payments, which are made by electronic transfer directly to their bank account. Specific travel agents are allocated to each study, allowing the subjects to become familiar and comfortable with the agent they are assigned. Electronic profiles that are data protected and PCI compliant are used to keep patient information up to date to for them. The travel agents also understand the subjects’ needs. For example, air travel can be unnerving for subjects who require special care and assistance including wheelchairs and access to oxygen. If a subject requires specialized medical care while travelling, arrangements can be made for road or air ambulances to ensure maximized comfort and medical care for the journey. By liaising with airlines using well-established partnerships, optimum service can be achieved. In the life of a study, one of the largest benefits that this service brings is all members of the study site team are trained to listen carefully to every subject and report their concerns or potential reasons for missing study visits before they actually happen. By paying special attention to the subjects needs, solutions were devised. For example, one subject could not wear a seatbelt due to the pressure it placed on them. The car company used for airport transfers explained it would be fined should the police stop them. After consultation between EQ and the sponsor, the sponsor with IRB approval agreed to pay the fine, should the driver be stopped. In another example, an Amish family taking part in a study were struggling to commit to their visits, and as a result of discussions between the subjects agent and the family, it transpired that they needed help in milking their cows on the days the study took place. After consultation with the sponsor, it was possible to secure the services of someone to milk the cows to keep the subjects on the trial. Besides the attention that the subjects receive, and the ability for the sponsor or CRO to outsource a non-core competency, improved budget control and cost savings can help the sponsor reduce expenditure through providing a study schedule that can be planned effectively in advance.